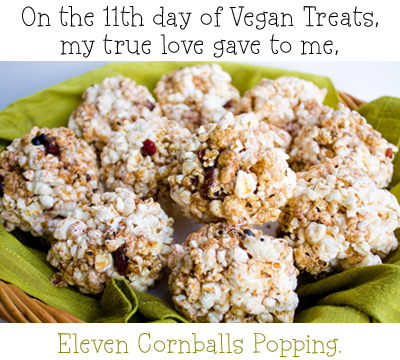 Sticky Sweet Popcorn Balls: 11th Day of Vegan Treats. Warning: Sticky Fingers Ahead. I have one warning for this recipe: you will get sticky. 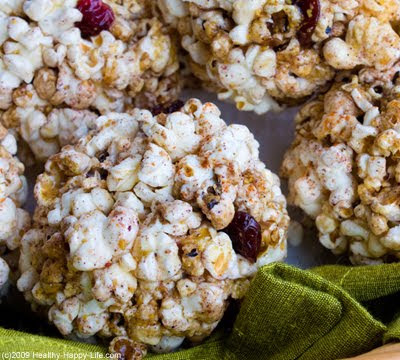 These balls are not molded by some handy-dandy popcorn ball maker, nope. They are made by your own two hands (and a sturdy plastic baggy). I mean, what do you use to make a snowball outside? I made-to-order snowball making device? Nope. Your hands! So get sticky and have some holiday fun. 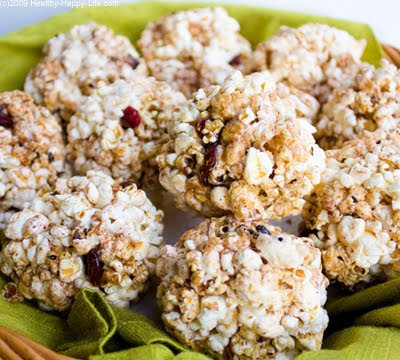 No Candy Thermometer Needed. I am of the candy-thermometer-less crowd. Candy making and 'sugar heating' is to my knowledge, an exact science. I know this. Thus, not having really any experience in this area of cooking, I don't really know why this recipe worked. But it did, so yippee for my 'sugar experiment'. After placing the formed balls in the fridge overnight they were perfectly sturdy. I was shocked, and pleased. So if you want to go all scientific on me with a candy thermometer and heat the sugar to just the right temp, go ahead, but thank goodness for me, no thermometer required. 1. 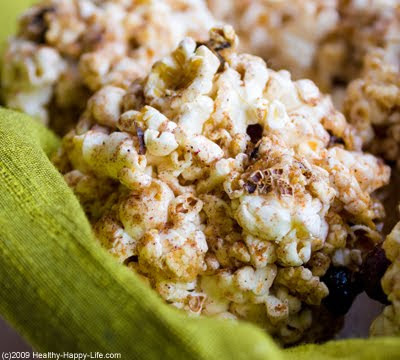 Make your air-popped popcorn. 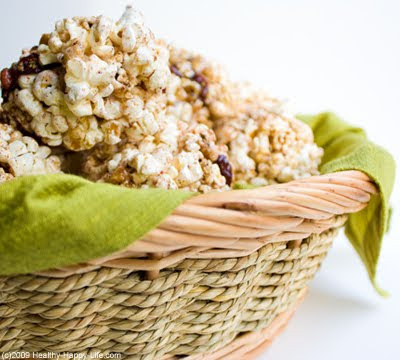 You can pop the corn in oil if you wish, but air-popped will work just fine. About 7 cups is good. Sprinkle with a dash of salt. Set aside to cool. If you are doing microwaved popcorn, you will need about 1 1/2 bags. 3. Bring your syrup to a boil. Stir constantly and boil for 90 seconds or so. 4. Remove pan from heat, stir your 1 Tbsp of cold soy creamer. Transfer your syrup to a small glass bowl and place in fridge for 20 minutes to cool and thicken. 5. In 20 minutes, your syrup should have cooled down and become like a nice sticky consistency that is a bit thicker than honey. 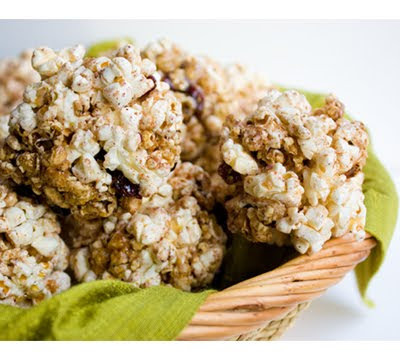 You can now pour about 1/4 cup of your syrup over you cooled popcorn. Toss well! 6. 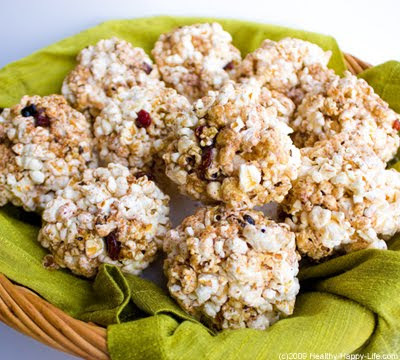 Next, fold in your dried fruit, flax seed meal, and any additional fold-ins and the flax seed meal. You can dash in a few extra spices if you'd like too. Continue drizzling syrup over your corn until you have used about 1/2 cup of syrup. Continue tossing well. You want the corn the get moist, but not soggy. 7. Next, grab your ball-makers, aka your little helpers, and a nice plastic sandwich baggie for each ball-maker. 8. Scoop about 3/4 cup of popcorn mixture into each plastic baggie, shake it all into one corner of the baggie. Squeeze down like a pastry bag. 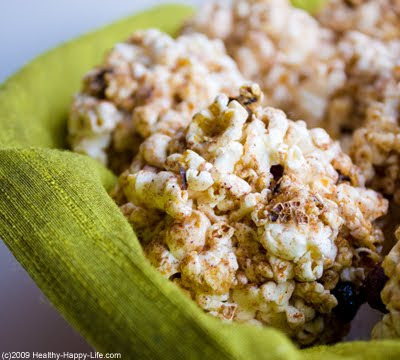 Then simply use your hands on the outside of the bag to firmly mold the popcorn into a ball. Squeeze hard. It's OK to crunch some of the corn. You may need to squeeze and hold for a few seconds to get the stickiness activated. (That was my technique anyways). 9. Carefully remove the ball from the bag and place on a wax-paper lined plate. Continue this process until all your corn is used. 10. You can drizzle a bit of the extra syrup over top your corn balls. Then cover them with plastic wrap and place them in the fridge for 2 hours to harden and chill. Overnight is best. 11. Serve cool and store in plastic baggies in the fridge. Too much exposure to air will turn the popcorn stale.